Top Rated Residential Sprinkler System | Free Quote Today! Want to be the envy and the talk of the neighborhood? Want to have a golf course quality lawn and be ecologically responsible while exerting minimal effort? American National Sprinkler & Lighting has the answer, an in-ground residential sprinkler system! 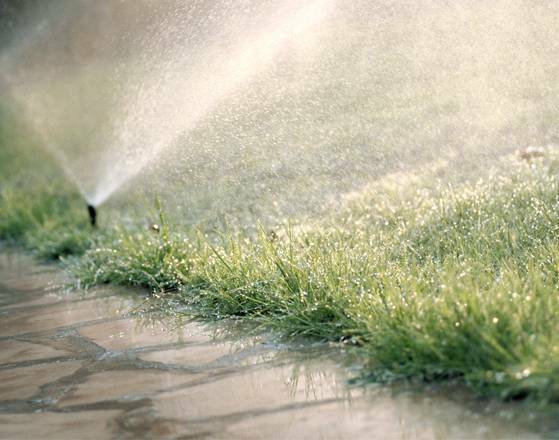 Utilizing the latest technology, American National Sprinkler & Lighting lawn sprinkler systems are self-sufficient watering systems, which provide the essential irrigation needs for lawns. When designed properly, a residential sprinkler system will eliminate the need to water with a garden hose thereby saving you valuable time and money. Once a system is installed, you can sit back and let the system do its job. Interaction between you and the residential sprinkler system is minimal, with minor adjustments being made for the particular season. Adjustments are made via the control panel, typically located in the garage and involve no more than manipulating a few buttons or rotating a dial. That's it! What are the advantages of owning an in ground lawn sprinkler system? You will not need to worry about over-watering. The system works on a timed cycle and will turn off when completed. The rain sensor gauge will turn your system off automatically when it starts to rain. There is no need to drag around hoses. You will feel confident your lawn/plantings will always be watered, even if you are not at home. Landscaping is delicate and expensive. Owning a sprinkler system will insure the lawn, flowers, shrubs and trees receive the correct amount of water on a consistent basis. Thus, your landscape investment will be protected. As quoted in the Chicago Tribune, "in ground sprinkler systems for lawns and landscaping are in high demand, especially in the upper bracket segment of the market, they add value to the selling price and help immensely in the sale of your home." When is the best time of year to install a lawn sprinkler system? What is the best time of year to install a lawn sprinkler system? Anytime between April 1st and the end of November would be a great time to install. If you want that beautiful lawn for the upcoming summer then the earlier the better! How long will it take to install an irrigation system? How long will it take to install the irrigation system? Most residential sprinkler systems are completed in one day! If your property is very large and/or weather conditions are poor (heavy rain or snow), additional time may be needed. If I have existing grass will the new sprinkler installation destroy my lawn? No. Our state of the art lawn sprinkler installation machinery will pull the piping underground creating only a slit in the lawn. These incisions are barely visible from the street. Once the installation is complete and the watering begins, your lawn will start to heal and any markings will be healed within three to four weeks. If I am building a new house, when should the system be installed?